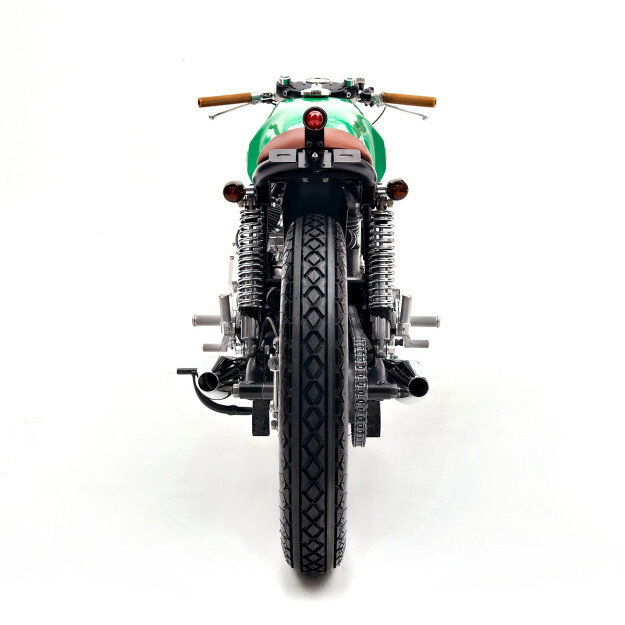 We’re used to seeing motorcycle and surf culture intersect. But in chilly Stockholm? Where the average July temperature is just 18°C (64°F)? Strangely enough, the juxtaposition of moto and surf lifestyles that’s common in California and Australia is now happening in Sweden. It’s fuelled by stores such as the oddly named 6/5/4, a hub for Stockholmares who ride the waves as well as bikes. 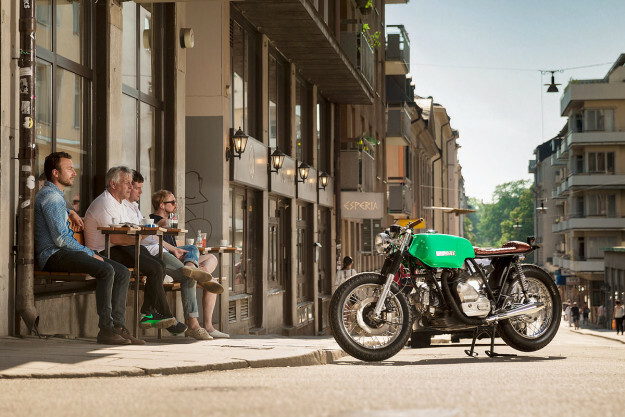 Owner Johan Orrestedt is a passionate motorcyclist himself. So when a 600-square-meter garage became available under his shop, he jumped at the chance to expand the business. 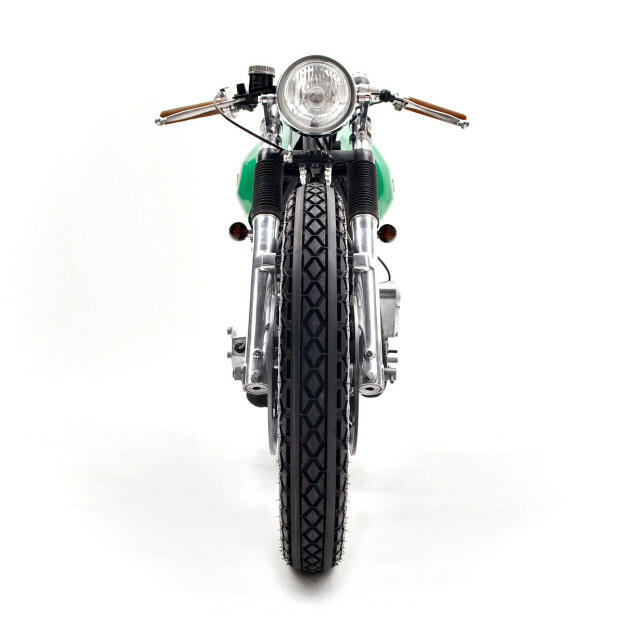 Together with friends Daniel Jakobsson and Johan Nordin, Orrestedt launched a custom motorcycle business. The trio had always built bikes in their spare time, and now had an excuse to go full time. And with so much space to work with (and rent to pay), they added on a ‘pay-to-wrench’ communal workshop—similar to Australia’s Kustom Kommune. 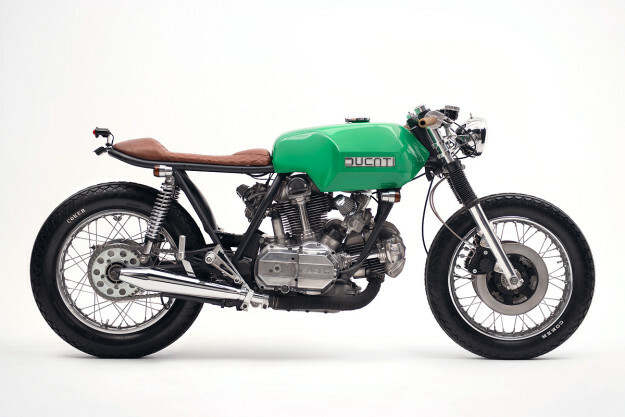 This crisp Ducati 860 GT is the latest from the 6/5/4 Motors workbench, and it’s as sharp as the wind that blows in from the Baltic. The guys had some very particular ideas for the project, so they settled on the GT as a donor. “The spectacular engine with its alien v-twin design, the iconic tank and that flat frame line were too good to overlook,” they say. Finding an 860 GT in Sweden seemed like an impossible task. But after a month of hunting around the team struck gold with a mid-70s GTS variant. 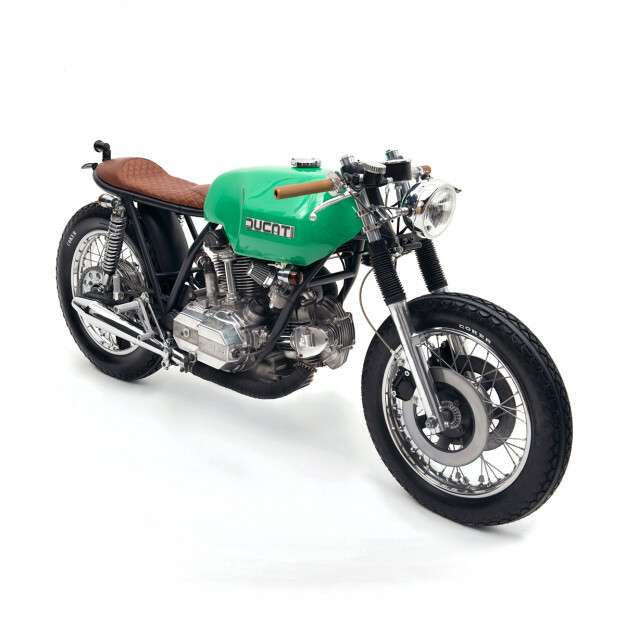 The owner was a Ducatista who had kept the bike in a barn for years—so it took vague promises to keep the bike ‘more or less’ original to pry it from his hands. They were stumped when it came to colors. Until, one late night, Orrestedt realized that the green of the beer can he was holding was perfect. Brown for the seat and grey for the frame seemed a harmonious match, and so the design was finalized and the build began. The Ducati was stripped right down. The engine was overhauled and given a much-needed service; valves were adjusted, and gaskets, oil, filters and nuts and bolts replaced. The carbs were renovated too, and equipped with a pair of filters in lieu of the original airbox. A pair of Dunstall-style mufflers now connect to the stock headers. Once the awkward-looking 860 GT side covers were turfed, the team de-tabbed and trimmed the frame. The rear was edited with a new loop, and mounts were added for the seat and electrical components. 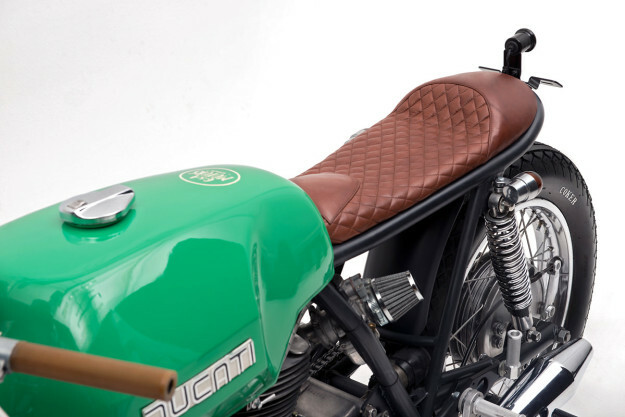 The seat itself is completely custom—built on an aluminum subframe and covered with washed leather from Swedish tannery Tärnsjö. It’s been stitched in a timeless diamond pattern. To keep the under-seat area totally open, 6/5/4 mounted a new, smaller battery under the tank. They also replaced the rectifier and installed a Motogadget m-Lock ignition, rewiring the bike in the process. The suspension is still original, but the front fork legs have been cleaned up and flipped around for a tidier front end. The wheels were refreshed with stainless steel spokes and new bearings, and are now wrapped in Coker Diamonds. For the cockpit, 6/5/4 fitted mini-switches, integrated into the bars. 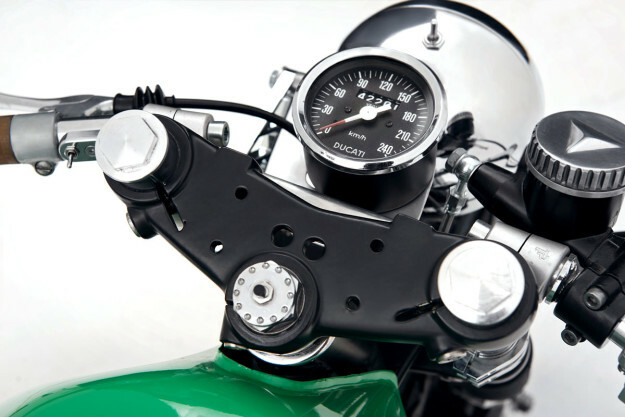 The original speedo was deemed too iconic to ditch—so it was restored, repainted and mounted on a custom bracket. The grips, levers and cables were all replaced, as well as the headlight, taillight and turn signals. 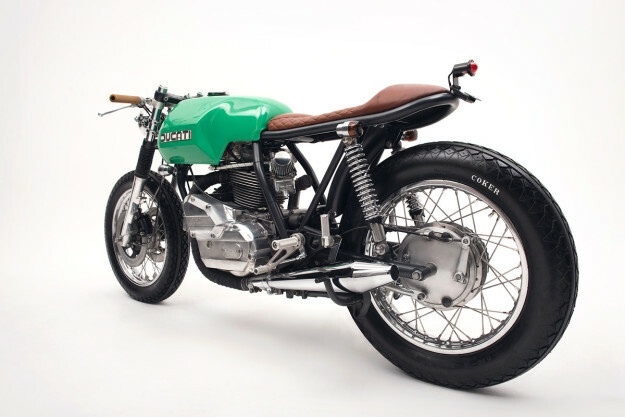 The finishing kit included a Tommaselli throttle, and Tarozzi clip-ons and rearsets—the latter fitted via adapters supplied by an old Ducati enthusiast in the States. Then the tank was painted in a glorious, vibrant green, and the bare metal components were polished. It’s understated, but seriously cool and weirdly engaging—just like a Stieg Larsson novel. We’re sold. 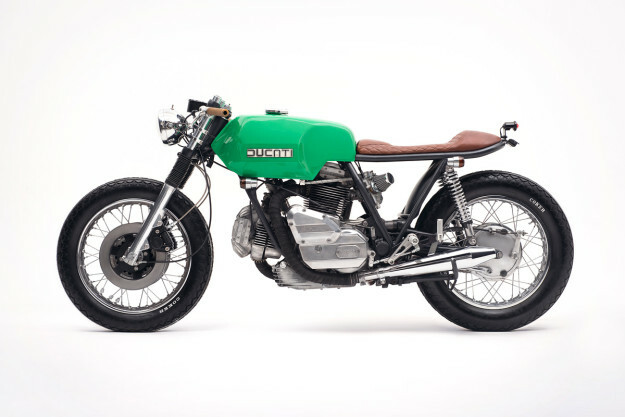 6/5/4 Motors | Instagram | Facebook | Tumblr | Photos by Simon Hamelius and Johannes Helje.